Two on line retailers have deals on Toyota Previas this week. 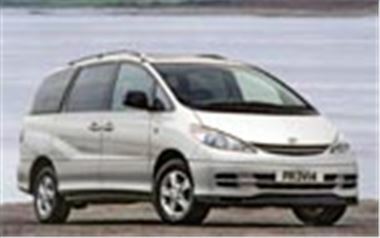 www.showroom4cars.com is offering the Previa 2.0 D4-D diesel GLS 8-Seater, on the road, for just £19,999, delivered to the customer's door. Including the cost of metallic paint, this represents a saving of around £3,200. Please note: this offer is on the GLS, not the more basic GS version of the Previa which lists at a lower £21,445. All vehicles are European supplied, in stock for immediate delivery, and come with Toyota's own 3-year pan-European warranty, plus 12 month's road tax. Various metallic paint finishes are available. Meanwhile, if you prefer the top specification CDX version of the Previa 2.0 D-4D diesel, GB CARS (UK) BROKERAGE LTD owner of website www.broker4cars.co.uk has this on offer at a discounted price of £2,2133.00 OTR a saving of £2,317.00 off UK list. These vehicles are available within two weeks and UK supplied direct from a contracted UK franchised Toyota Dealership so customers are entitled to three years Manufacturers warranty and road side assistance. For more details of this and other offers on UK supplied Toyotas visit www.broker4cars.co.uk or telephone the sales hotline on 01773 745525. Finally, to celebrate the launch of its new Light Commercial Vehicles section, www.showroom4cars.com has a special offer on UK supplied Renault Kangoo vans. All are available within one week, come with three years manufacturer/dealer warranty, and you can have any colour you like, as long as it's white!